If you’re still considering whether to add a Google+ badge on your website, consider this: We recently looked at top sites using the badge and found that, on average, the badge accounted for an additional 38% of Google+ followers. When you add the badge visitors to your website can discover your Google+ page and connect in a variety of ways: they can follow your Google+ page, +1 your site, share your site with their circles, see which of their friends have +1’d your site, and click through to visit your Google+ page. These activities can help you expand your audience by enabling your users to share and recommend your content. Making the violation messaging clearer to ensure the actions you need to take are clearly highlighted. Providing you with more information on how to contact the AdSense policy team and where to find important resources. After a ground-up rebuild of our AdSense Help Center we’ll continue to focus on improving usability and content quality in 2012. We’ll also be testing more personalized support options and want to make the available levels of support clearer for you. In the coming months, we’re hosting events in various countries to give you the opportunity to meet the AdSense team in person, ask questions, and get optimization tips. We want to be more accessible for you, so opt in to our “Special Offers” emails in order to receive event invitations and watch out for more information on our Inside AdSense blog or the AdSense newsletter. We’ll collect and share new case studies focusing especially on small to medium sized publishers, with examples from specific verticals or industries to make our optimization suggestions even more relevant for you and your website. Following your suggestion to feature more local updates, we’ll incorporate local content in our AdSense newsletter, whenever possible. A big thank you to everyone who participated in this survey! If you’d like to participate and share your thoughts with us in upcoming surveys, make sure you update your email preferences to receive “occasional surveys to help us improve AdSense”. It's already a few weeks into the new year, but it's never too late to set resolutions. That’s why today we'd like to share the outcome of our bi-annual publisher satisfaction survey. If you’re opted in to receive occasional surveys from us, you may have seen or filled out this survey. Over 28,000 of you participated globally, and we received more than 33,000 comments on your favorite aspects about AdSense as well as changes you’d like to see. The main areas of improvement that emerged from the survey are: AdSense Program Policies, AdSense Support, and Communication from AdSense. Your feedback is very important to us and we'd like to share some insights on what we've done in these areas so far and how we want to further improve them. We’re also working on improving in other important areas like payments and we'll continue to report back on those throughout the year. Visit the Chrome Web Store and download the AdSense Publisher Toolbar. This will add the toolbar icon to your browser. You’ll then need to grant the toolbar access to your AdSense account. To do so, click the toolbar icon and then sign in to Google Accounts with your AdSense login and password. Next, visit a website where you've implemented your ad code, and enable the toolbar by clicking on the toolbar icon again. And that’s it! 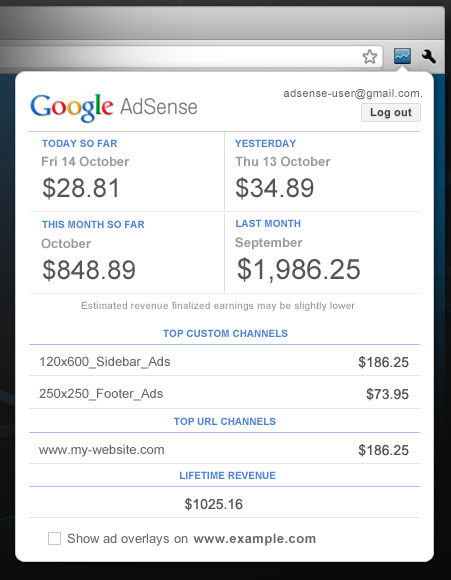 The AdSense account overview widget will appear and show you an earnings summary, broken down by recent and all time performance as well as your top channels. You can also enable ad overlays directly on top of your ad units, which will tell you how a particular ad unit has performed today, yesterday and in the past seven days. Clicking on the ad overlay will bring you to the “My ads” tab in your account, where you can edit this ad unit. If you have ad units using the older version of the code, or ad units created on partner sites like Blogger, we’ll instead show information on the ad unit size or channel. Rest assured that clicking on the ad overlay generated by the toolbar won’t create invalid clicks. For more detailed instructions on how to use this toolbar, visit our Help Center. We hope that this new feature provides a useful way to quickly check on your AdSense account performance while browsing the web. Stay tuned for updates as we work on adding new functionality to the toolbar. We’re always looking for new ways to make it easier for you to use our tools, help you save time, and better understand account performance. 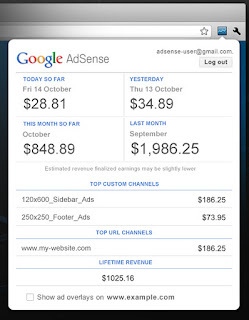 With this in mind, we’re happy to share with you a new Chrome extension called the AdSense Publisher Toolbar. When viewing your website, this feature will show you a snapshot of your AdSense account performance as a widget in the corner of your browser window. It also includes ad overlays that describe the recent performance of specific ad units, and gives you the option to access AdSense directly. At the moment this toolbar is only available in English, but we’re working to make it available in additional languages in the near future. to show you how much you’re earning from Google-certified third party ad networks, we’ve received questions from publishers around how to make sense of the numbers they’re seeing. Some have let us know that they’re now blocking lower-performing ad networks based on revenue per thousand impressions (RPMs), a practice which can actually have a negative impact on overall revenue. Today, we’d like to take a moment to address your questions and provide more guidance around understanding your reports and blocking specific ad networks. Let’s first talk about analyzing RPM figures. If you’ve ever tested color combinations for your ad units using channels, you’re probably used to comparing the RPMs of each channel to determine which one is most effective. Then, once you find the most effective combination, you remove all the other options and only use the optimal one. This works for channels, but it’s important to keep in mind that with Google-certified ad networks, the same approach doesn’t apply. Network B has the highest RPM and appears to be outperforming the other networks. It’s important to note though that this metric is based on only 14 impressions and might not reflect the same revenue for the next 1000 or 10,000 impressions. The value of impressions can vary widely, so the RPM for a small number of impressions can be misleading. Network C has the lowest RPM. However, blocking Network C because of this might have a negative impact on revenue. This is because our system will always maximize the value of every impression in an auction -- if an ad from Network C appeared on your pages, it was because any other eligible ads that could have appeared would have generated less revenue for you. By Blocking Network C, another network with a lower-paying bid might win the ad auction instead. In general, blocking reduces the number of ads participating in the ad auction, which can then have a negative impact on your potential revenue. Please keep in mind that blocking “low paying ads” is a myth, as any ad that appears on your page has won the auction for that space and will earn you the most possible. At the same time, we also understand that you sometimes need to prevent ads from appearing due to the content of the ad or advertiser. You have several options in your account, which are suitable for different scenarios. With your feedback in mind, we’re constantly working on offering you more control over the ads appearing on your sites, so watch this space for further announcements! However, don’t forget to carefully consider which ads you’re blocking to ensure that you reach your full revenue potential. Since launching a new report to show you how much you’re earning from Google-certified third party ad networks, we’ve received questions from publishers around how to make sense of the numbers they’re seeing. Some have let us know that they’re now blocking lower-performing ad networks based on revenue per thousand impressions (RPMs), a practice which can actually have a negative impact on overall revenue. Today, we’d like to take a moment to address your questions and provide more guidance around understanding your reports and blocking specific ad networks. and the best ways to monetize them, and also just released Custom Search Ads for Mobile to help you take advantage of this trend. As part of our focus on helping you monetize your content across all screen sizes, we’ll soon also be improving the way ads appear on different devices. We’re making our text ads smarter and will soon display them differently so they perform optimally depending on where users are viewing them from: computers, tablets, or smartphones. The best part is that our ads do the right thing automatically - without any changes required to your web pages - by detecting what device your web page is being viewed from. With this change, we’re taking advantage of the unique features of mobile devices to deliver more engaging, better-performing ads. Since the screens are smaller, we’re reducing the number of ads per ad slot and increasing the size of the text to make them more legible and noticeable. 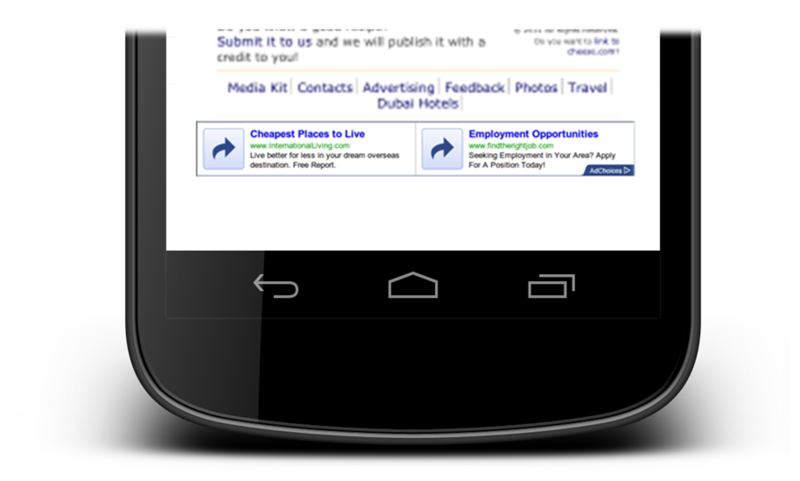 We’re also providing a big button on each ad to make it easy for users to select the ads using a touch screen. Here’s how the 728x90 leaderboard will appear differently on the different platforms. We’re continuing to look for ways to improve ad performance for publishers, no matter what size screen your users are accessing your site from. Stay tuned to Inside AdSense for more updates. As smartphones and tablets become more and more popular, your websites are being viewed on a wider variety of devices - with different screen sizes and features. We’ve recently discussed the importance of having mobile friendly sites and the best ways to monetize them, and also just released Custom Search Ads for Mobile to help you take advantage of this trend. As part of our focus on helping you monetize your content across all screen sizes, we’ll soon also be improving the way ads appear on different devices. team is preparing for our first series of North America events in 2012. We’re excited to hit the road and meet with more publishers across the country. At the events, we’ll focus on how to maximize your AdSense revenue, introduce our free DoubleClick for Publishers Small Business product and offer suggestions for monetizing your mobile pages. We’ll also meet with each attendee to review your websites and offer customized AdSense solutions. Many publishers have found the events to be great ways to meet and connect with other local publishers. Once you register, event details will be sent to you prior to the event. We look forward to meeting you soon! The AdSense in Your City team is preparing for our first series of North America events in 2012. We’re excited to hit the road and meet with more publishers across the country. At the events, we’ll focus on how to maximize your AdSense revenue, introduce our free DoubleClick for Publishers Small Business product and offer suggestions for monetizing your mobile pages. We’ll also meet with each attendee to review your websites and offer customized AdSense solutions. We understand that payment options are very important to you, so we continuously work to improve them. Today we’re happy to announce that we’ve expanded Western Union Quick Cash® as an AdSense payment method to three additional countries: Singapore, Cambodia and Laos. For those of you who aren't familiar with this form of payment, Western Union Quick Cash payments are free and will reach you faster than checks. Payments follow our normal payment schedule and are available for pickup in your local currency at your local Western Union agent the day after they're issued. It’s important to note that at this time we can only send Western Union payments to publishers that have an individual account. Also, the payee name on your account must exactly match the government-issued ID card that you'll use when picking up your payments. For more information on how to sign up for and pick up Western Union payments, please visit our Help Center. For those of you who don’t yet have Western Union Quick Cash as a payment method in your country, we appreciate your patience as we work to make this available. Please continue reading our Inside AdSense blog to learn about future launches. Happy New Year from the AdSense team! We enjoyed celebrating the holiday and hope you did too.